Bring a taste of safari into your home with this amazing giraffe. Standing at 141.5cm tall, he certainly makes an impression: in fact, children will look up to him for many years! This giraffe is the perfect accessory to any nursery or playroom. He has authentic details and a plush finish. Great deal for the kids this Xmas...what a special day waking up and seeing a huge giraffe...WOW!!! Love Girafes and check out the penguin for a tenner. 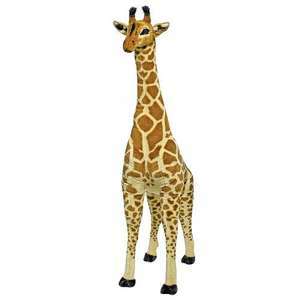 I have this giraffe for my soon to arrive baby boy (well more for me really), and its awesome, paid £41 from Tesco. The most I had seen this for was a ridiculous £395 in a toyshop in Lyndhurst when the rrp is £70!! Elise does it really stand up like the picture? Is it, for want of a better word, cuddly? I really like the idea but a huge waste of space if the kids don't like it! Amazon have the same price, although with Join Lewis you can return to store. Wahey - just ordered from amazon for the nursery, and as an added bonus I had amazon vouchers collecting dust! What an absolute waste of money. I tell ya - the world's gone mad. I want the giraffe and the penguin. Nice legs, shame about the space!!! Deal posting newbie! This is DavyGee first deal post. Help out by leaving a posting tip or just to show your appreciation for their contribution.